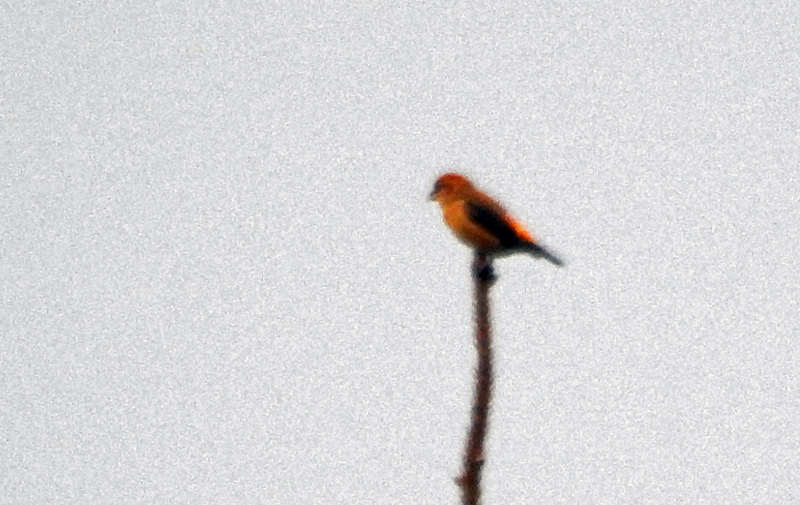 MID-ARGYLL: A search for the Snow Buntings in the Cairnbaan forest at Daill Loch today – some distant flight calls were heard but birds not seen. 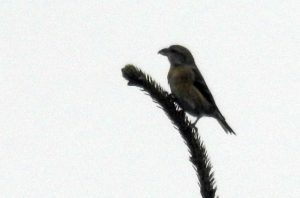 Four Common Crossbills seen and some terrible shots taken at long range of 150+ metres (Jim Dickson). A Nuthatch was back at Lynsey Gibson’s garden in Ardrishaig today. TIREE: Sea-watch off Hynish in S8 to SSW7 at lunchtime produced the following (all heading SW) in 1hr: 3 Little Auk, 6 Puffin, 1 ad Lesser Black-backed Gull, 355 Razorbill (all large auks viewed well were this species), 6 Tystie, 91 Gannet, 108 Shag, 65 Fulmar, 112 Kittiwake (all ads), 130 Eider and 12 Great Northern Diver (John Bowler). Crossbill – Daill Loch, Mid-Argyll 14th Feb (Jim Dickson).